What are the chances the Oregon Ducks go for two following their first touchdown? The statistics are overwhelming. How many times did the scoreboard read 8-? in favor of the Ducks? According to goducks.com, the Ducks were 95% in points-after-touchdown attempts. Now, you’re probably thinking that statistic should be 100% because a 20-yard field goal is just a pitch shot, right? That stat is lower because the Ducks are risky and often go for two following the first touchdown. They see the extra point as an opportunity for more. Not many teams take that opportunity; therefore, not many are prepared to face an opponent that does. Oregon meets Florida State in the 101st Rose Bowl and the first ever National Playoff Semifinal game January 1, 2015. Before coming to Oregon, Alie sported a Sheldon High School football jersey on Friday nights. In 2012, he led the Irish to a state title. 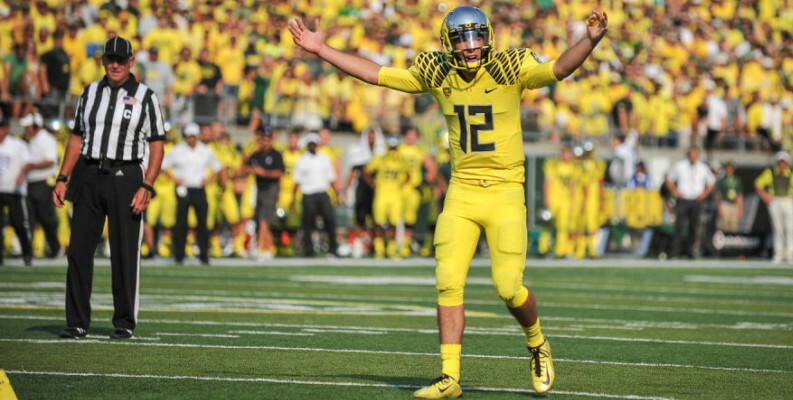 While thinking about his next step, Alie watched Oregon QB Joey Harrington (1998-2001) lead the Ducks. Making the decision to play for Oregon was easy for Alie. In 2013, Alie walked onto the team and eventually worked his way into a role not many would account for. 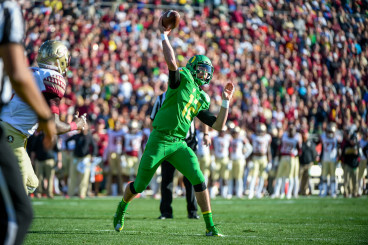 According to the 2014 football statistics on goducks.com, Alie was 18 for 21 on holding for field goals, 79 for 83 in Points After Touchdown (PATs), and ran for a pair of two-point conversions, vs. South Dakota and UCLA. He also added two throws, against Michigan State and Florida State in the Rose Bowl. The decision to go for two following the touchdown is a combination of both Alie and the coaches’ reads. 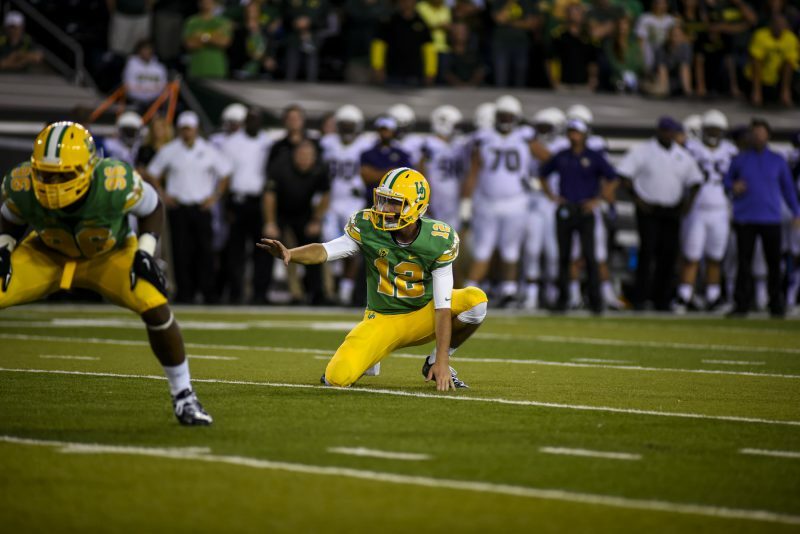 If the opponent looks to be on its heels and not prepared when the Ducks spread out? Advantage: Ducks. When the offense just went 80 yards in under two minutes and the defense looks winded? Advantage: Ducks. Why not go for two? The Ducks just make it look easy, don’t they? I know that teams watch film on the Ducks, studying offensive plays and defensive formations, but do they fast-forward over the conversions? “You can tell the teams that did take the time to study film and they’re well-prepared. Usually we just get one point in that case,” says Alie. Or in last year’s case, four attempts.